The Beantown Bloggery: Remember, Remember, the 10th of February? I was walking to brunch yesterday with my friend Jake and as we passed Copley Square, we saw a group of folks hanging around wearing Guy Fawke's masks. Very strange, I thought to myself, but I've seen stranger so I thought nothing of it and kept walking. Well in the newspaper today, I see why they were wearing those masks and that I 0nly saw a small portion of the real group. 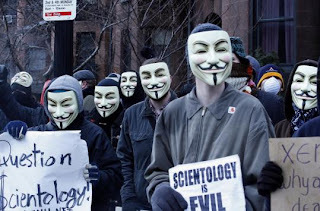 As you can see from the picture above (From the Globe), they were there to protest Scientology. According to the article, they were members of an informal internet group called "Anonymous." I wonder if this has anything to do with the recent deal where the scientologists bought the Alexandra Hotel (here). Man, those masks are cool. Now I have the sudden urge to watch V for Vendetta again. 1 Response to "Remember, Remember, the 10th of February?"